Mission San Juan Bautista was the fifteenth one built in California, founded June 24, 1797, by Father Fermin Lasuen. The name San Juan Bautista means St. John the Baptist. Mission San Juan Bautista was the largest mission church in California. It has been in continuous use since 1812. The mission is located beside the San Andreas Fault and was featured in Alfred Hitchcock's film Vertigo. Where Is Mission San Juan Bautista Located? The mission's address is 2nd and Mariposa Streets in San Juan Bautista, CA. Visit the ​Mission Website for current hours. San Juan Bautista Mission is also part of State Historic Park. It faces a plaza little changed since the late nineteenth century that includes a hotel, stable and two adobe mansions, all of them are original buildings more than 100 years old. For more information about San Juan Bautista State Historic Park check their website. In 1797, Father Junipero Serra led a Roman Catholic pilgrimage to bring Christianity to the wilderness in California. For the location, he and the Franciscans chose a site at the foot of the Gavilan Mountains near the El Camino Real, which they named San Juan Bautista Mission after Saint John the Baptist. The site was chosen because it promised an "abundant harvest of souls" in the San Juan Valley. In late spring, Spanish Corporal Juan Ballesteros and five men came, and in a month they erected a chapel, houses for themselves and the Padres, and a granary. Then, only thirteen days after he dedicated the San Jose mission, Father Lasuen arrived for the formal San Juan Bautista mission dedication on Saturday, June 24, 1797. The first baptism at San Juan Bautista was an Indian child about ten years old, with Corporal Ballesteros as a sponsor. The first white baptism was the corporal's son and the first funeral, in September, was for his infant son. Fathers Jose Manuel de Martiarena and Pedro Martinez, who supervised the construction, found the native people friendly and cooperative and the San Juan Bautista Mission grew quickly. The first six months were busy, and by Christmas, they built an adobe church, a monastery, granary, barracks, guardhouses and adobe houses for the neophytes. By 1800, more than 500 Indians were living at San Juan Bautista mission. When San Juan Bautista Mission was founded, no one knew that it was located on top of the San Andreas Fault. However, they soon learned about the fault and its intermittent tremors. In October 1798, the shaking was so severe that the missionaries slept outside for the whole month. There were as many as six tremors in one day, making huge cracks in buildings and the ground. The Fault caused several damaging earthquakes during the early history, but San Juan Bautista mission never moved. The first significant earthquake occurred in October 1800, doing considerable damage, and a portion of the original building fell. The Indian population continued to increase, and by 1803 there were plans to build another church. People from all over the province were invited to an elaborate ceremony which kicked off the construction. The new San Juan Bautista mission church was not completed until 1812. In 1808, a new padre, Father Arroyo de la Cuesta, arrived. Father Cuesta was energetic and enthusiastic, and he convinced the builders that a wide church with three naves would be an unusual asset here. Because of Father Cuesta's influence, it was the largest church in the province and the only structure of its kind ever built by the Franciscans in California. While the church grew, the congregation it was planned for declined. In 1805, the native population was 1,100, but by 1812 it was reduced to less than half because of death and desertions. The great new space dwarfed the small congregations, and Father de la Cuesta walled in the two rows of arches which separated the three naves of the church. In 1812, Father Tapis retired from the office of Presidente and joined Father de la Cuesta. Teachings continued under Father Tapis from 1812 to 1825. During 1824, the San Juan Bautista mission population grew again, with people moving in from the Tulare Valley, possibly because of aggressive military expeditions to the interior territories. The population peaked during 1823, with 641 male and 607 female residents. Twenty-two adobe dwellings for Indians were constructed that year, and there were reports of adobe corrals, a granary, a kiln, and weaving rooms restored with the new large labor force. In 1827, a report filed to the governor listed San Juan Bautista mission livestock and rancho lands, listing holdings that included 6,500 head of cattle, 750 horses, 37 mules, sheep. There was no irrigation, but the pastures were watered by an overflow of the Pajaro River. They got good timber from the mountains to the northeast. Springs from the Gavilan Mountains ran to irrigate the gardens, vineyard, and cornfield. In 1833, Zacatecan Franciscans from Mexico took over. The Zacatecan period lasted a brief two years. After Mexico won its independence from Spain, it could not afford to keep the missions running as Spain had done, and in 1834, Mexico decided to end the system and sell all of the lands. 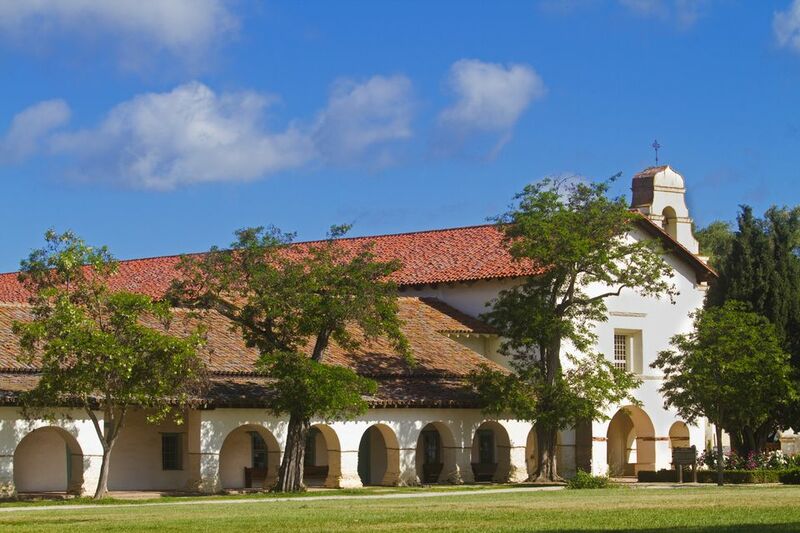 In 1835, under the secularization act, San Juan Bautista Mission was reduced to a curacy of the second class, under a civil administrator, and its assets sold. The history after secularization is happier than at some of the other missions. The people continued to support the church, and services have been held here without interruption. After secularization, San Juan Bautista became a pueblo. The mission property was inventoried in 1845 by Pio Pico's brother Andres, who listed at a parish house of 16 rooms made of adobe with brick tile and packed clay floors and tile roofs. The garden to the north of the complex and an orchard of 875 fruit trees were surrounded by a wall constructed of old cattle bones. The abandoned vineyard still held 1,200 vines. Total land at that time consisted of 7,500 square varas. A small settlement of whites grew up in the pueblo, and there were some 50 inhabitants in the town of San Juan by the end of 1839. Nearly 30 years after secularization, the missions were returned to the Catholic Church. When the title was restored to the church, its lands comprised 55.13 acres. Today there are modern buildings at the back of the garden. The old monastery wing, with its arches facing the only remaining Spanish plaza in California, houses a museum. Hidden steel beams give earthquake protection, the bell wall has completed, and the side aisles restored. Church services are still held every week. San Juan Bautista Mission is seen in Alfred Hitchcock's film Vertigo. Fans of the movie may notice that the bell tower, featured in two dramatic scenes in the film, does not exist. The Mission San Juan Bautista picture above shows its cattle brand. It was drawn from samples on display at Mission San Francisco Solano and Mission San Antonio. It's one of several mission brands that include the letter "A" in various forms, but we have not been able to find out its origin. San Juan Bautista is the largest mission church in California at 188 feet long, 72 feet wide and 40 feet high. It is made of adobe brick three feet thick, with a red tile roof and floor. Its walls are three feet thick with cement support, and its cloister is 230 feet long. The original church design by Father Cuesta called for three aisles and a capacity of more than 1,000. However, the plan was changed during construction, either because of concerns about earthquakes or because the declining Indian population did not require such a large building. Just inside the massive carved entrance doors, on the old red tile floor you can see 180-year old animal paw prints, probably left by some wandering pets before the tiles dried. Look for the cat door in one of the side doors, left over from a time when cats kept mice away. In 1906, an earthquake struck San Juan Bautista. It destroyed the church's side walls and some of the outbuildings. After the earthquake, the mission was rebuilt and strengthened with concrete. The Hearst Foundation paid for a restoration in 1949. Originally, bells hung from a wooden crossbar in the courtyard, and the church had no bell tower. A wooden tower was added in the 1860s, and it was later duplicated in concrete. The tower made it easy to ring the church bells comfortably in any weather, but it was removed in the early 1950s. In 1976 a campanario, or bell wall, was erected (or possibly rebuilt) in the style of the other missions. Initially, nine bells hung outside the church, but only three of them remain. The crank-operated English barrel organ is a source of many stories and legends. It made its way here from Monterey sometime in the late 1820s. It most probably was given to Father Lasuen by the British explorer Vancouver. The organ was built in London and is more than 5 feet tall, two feet wide and 18 inches deep. Inside are 17 wooden pipes and 29 metal pipes which sound when the crank is turned. Some legends grew around this organ, one of which gave it unusual powers and linked it with the mission's founding. The organ is an odd thing to have in a church, though. Its tunes are reported to include "Go to the Devil, Spanish Waltz, College Hornpipe, and Lady Campbell's Reel," tunes better known by rowdy sailors than pious fathers. The most interesting story about the barrel organ is reported in Sunset Magazine's The California Missions: A Pictorial History: "Of the many stories concerning this barrel organ, one of the best shows its almost hypnotic power over the child-like savages. A tribe of warring Tulare Indians swooped down on the mission one day, and the neophytes ran for cover. Fortunately, the padre kept his wits. He lugged out the hand-organ and began cranking. The neophytes caught on and began to sing with the music at the top of their voices, with the result that their foes were so entranced that they lay down their weapons and demanded more music, even asking to stay so they could enjoy it all the time."